I recently gained some experience with Return Oriented Programming but my first attempt to build a ROP based exploit on my own was a failure at first (read about it here). However in order to solve the problem I had to understand exactly what went wrong and that forced me to read and understand the shellcode I had chosen. I had chosen windows/exec and putting a breakpoint before it showed me that the decoder was in fact executed and decoded the shellcode. Also, the decoded shellcode was an exact match with the code I encoded. So...on with the reversing. Let's cut it up a little and comment what happens. In my point of view the code consists of three overall stages: Setup, "Magic" function and execution. ;The value pushed is the address of the instruction following the call. Setup is short. The magic function will use LOD* instructions and they should move from low to higher adresses so the direction flag is cleared. Then the code calls past the magic function to a POP EBP so that EBP contains the address of the function. I will describe the magic function later since it is quite large...for now know that it locates other functions and executes them. * and the penetration tester chose to use ExitThread. The magic function (which we will look at in a moment) takes a hash of the function that we want to call combined with a hash of the dll that contains the function, plus any arguments to the function we want to call. So we start by having it invoke WinExec with "calc" and SW_SHOWNORMAL. After that we call an exit function. We can override which function should be used by specifying the EXITFUNC option to 'msfpayload'. Valid options are 'process' which corresponds to ExitProcess, 'thread' which corresponds to ExitThread, 'seh' which is SetUnhandledExceptionFilter, and 'none' which will just call GetLastError. As we can see, the shellcode will not use ExitThread if running on a Windows version higher than XP. In this case RtlExitUserThread will be called instead. So, now we know what functions will be called. Lets take a look at the magic function to see how this is actually done. The magic function is not actually magic, but it is very clever. It is a sort of hashed linker using Skapes trick for finding a function inside a dll whose name equals a hash, but instead of us having to specify the base address of the dll to search this function will search all loaded dlls for a function matching the hash. Something like that. The function removes the hash from the stack and puts the original return address on the stack instead so the jump to the found function will act like a call. When the found function returns it will not return into the FindAndExecute function but to the location where FindAndExecute was called. Very clever. Lets see how this is actually done. Now EDX points to the first list list entry in memory order. Here begins a loop through all entries in the list. Now ESI points to the dll name in Unicode, ECX contains the maximum length in bytes (number of bytes used for the name plus null terminator) and EDI is zero. EDI will eventually contain the hash. Now we enter a hashing loop. 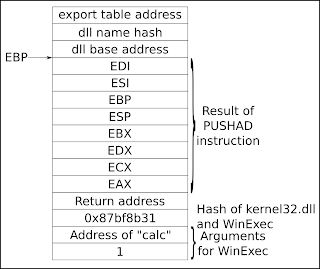 Now EDI contains the hash of the dll name, and EDX still points to the dll in memory order list entry. Next we will find the current dll export list so that we can iterate through all exported functions. 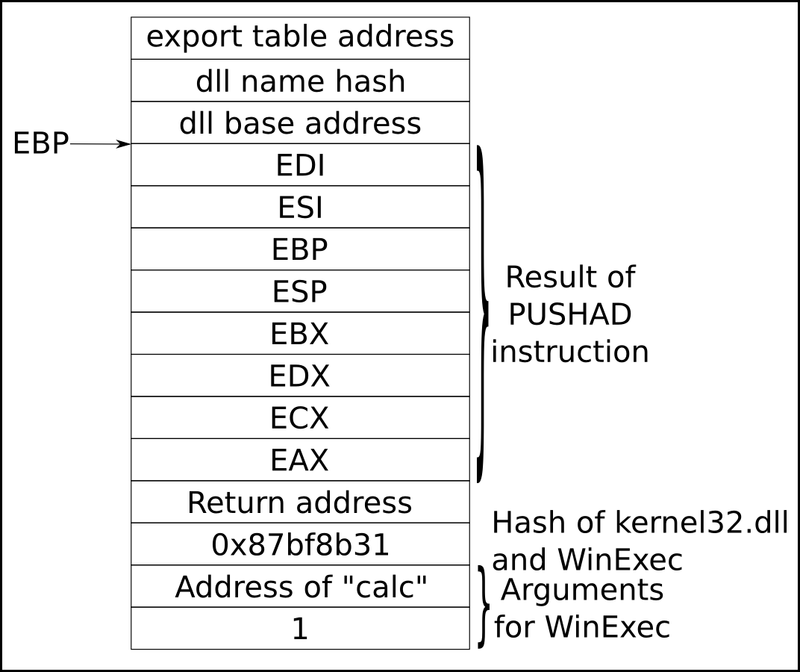 At this point ECX contains the number of exported symbols, EBX points to the first entry in the export list and EDX points to the dll base address. The export entries are offsets to where the name lies in memory. Next comes a loop over all the exported symbols. If we get past the JNZ instruction it is because the hash matched. In that case the corresponding function should be executed but first its location needs to be found and the stack must be prepared so that it looks like it was called normally. The return address is the address of the instruction following the 'CALL EBP' which invoked the magic function. It is the address we want WinExec to return to, so when we have found WinExec we need to remove all the other stuff on the stack and put the return address where the hash is now. Lets see how this happens. Now we have the address of the function in EAX. Next we fix the stack. The last four instructions do the clever "call" to the found function. WinExec will see the original return address and two arguments, believing it was called normally. Now the analysis is complete. One thing to note about this last bit is that the function you look for had better be found. Otherwise the program will certainly crash as there is no check for having reached the last entry in the linked list. I hope you will agree that this function is not really magic but rather a thing of beauty. It is very generic and thus can be used as a basic building block in all shellcodes. And this is exactly what has happened. If you look in all Windows payloads in Metasploit you will see this function. After I had reverse engineered the windows/exec shellcode someone told me that I could have read the original assembly source with comments. It is located in 'external/source/shellcode/windows/x86/src/single/single_exec.asm'. While this is true, I believe that I got more out of doing the hard work myself. When reverse engineering you really have to understand all the details and look up documentation on the different structures that are used. When reading the comments I have a tendency to skip this and just trust the comments.